Belgium’s Philippe Gilbert put the memories of a miserable season with a devastating solo victory in the elite men’s World championships in Limburg, Netherlands. The Ardennes specialist put in a devastating attack on the final climb of the Cauberg, with just over two kilometres to go, and managed to hold off an elite group of chasers all the way to the line. Gilbert had been responding to an attack by Italian Vincenzo Nibali, after he had been set up at the foot of the climb by teammate Luca Paolini. 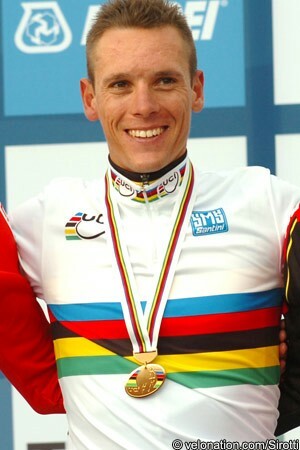 Gilbert had been carried to the head of the race by four of his Belgian teammates however, and jumped past the Italian as he launched his own move. Norway’s Edvald Boasson Hagen, Russia’s Alexandr Kolobnev and Spain’s Alejandro Valverde gave chase on the climb but, with Gilbert well clear with a kilometre to go, began to look at one another and were swept up by the chasing peloton. Boasson Hagen managed to stay clear however, to take the silver medal four seconds behind Gilbert, while Valverde just managed to hold off German sprinter John Degenkolb at the head of a depleted peloton another second later. "I went on the steepest part of the Cauberg and totally focused on my effort," Gilbert explained. "Until 200 metres, then I saw the win was there. I really enjoyed all the fans and knew my family and friends are here. A fantastic feeling. "It’s hard to realise I’m the world champion," he added. "I’ll be wearing the jersey for the first time in Piemonte, that’s going to be a great moment. "The whole team took it’s responsibility after missing getting into the first breakaway," Gilbert explained. "It wasn’t a perfect situation. A group of about six was allowed to go if there were no riders from Spain or Italy in it. It turned out different. A group of 29 formed with just two Belgian riders. That wasn’t good. Now we really had to push to close the gap." The long break of the race had come from Vitaliy Buts (Ukraine), Gatis Smukulis (Latvia), Winner Anacona (Colombia), Dario Cataldo (Italy), Jérôme Coppel (France), Timmy Duggan and Alex Howes (both United States), Fabricio Ferrari (Uruguay), Vladimir Isaichev (Russia), Pablo Lastras (Spain) and Luca Mezgec (Slovenia). They had managed to open up a lead of five minutes on the opening 100km loop, and were joined by ten more riders on the early laps of the 16.1km circuit. An attack from Spain’s Alberto Contador pulled yet more riders across to the leaders, taking their number up to 29 but, despite strong work from the French, Italians and Spanish in the group, they were caught by the peloton on the Cauberg with just over two laps to go. The penultimate lap saw an attack from the United States’ Andrew Talansky and Great Britain’s Ian Stannard, but they too were caught on the Cauberg, and the race was all together with one lap to go. The final lap saw the big teams move their leaders into position, and Paolini led Nibali onto the Cauberg for the final time; as soon as the Italian began to accelerate however, Gilbert put in his attack, and the Belgian powered away to take the title. His victory came after an indifferent season, compared to the standard he has set for himself in 2011, but the Belgian managed to perfect his form at just the right moment to win the biggest one-day race that was missing from his palmares. "It’s been a difficult season but the team had faith in me," he explained. "I’m very thankful because my transfer was a big one for BMC. We didn’t win the TTT because of a mistake at the Cauberg. We should’ve taken that title. "I had three goals this year," Gilbert continued. "Liege-Bastogne-Liege, Amstel Gold Race, the Olympic road race and the worlds. Didn’t do too bad I think. "My form was good after the Tour [de France] where I worked for my teammates. I built up towards the Olympics and found real strength in the Vuelta. I won two stages with a similar finish as in Valkenburg. So that gave me confidence." The elite men’s race was to consist of ten laps of the same 16.1km circuit as used by the rest of the World championship road races. Unlike the others however, the race would start in the Limburg capital Maastricht, and complete a 100km loop around the region before arriving on the Valkenberg circuit. After the usual flurry of attacks - which saw a crash bring down three-time champion Oscar Freire of Spain - Buts and Smukulis escaped the peloton. They were briefly chased by compatriots Oleksandr Polivoda (Ukraine) and Aleksejs Saramotins (Latvia) but, shortly afterwards, the group of Anacona, Cataldo, Coppel, Duggan, Howes, Ferrari, Isaichev, Lastras and Mezgec escaped and crossed the gap to the two leaders. With the eleven-man group’s lead still less than a minute, the peloton stopped for a mass ‘comfort break’, and the gap was allowed to widen. As it approached five minutes the Great Britain team came to the head of the peloton, with outgoing champion Mark Cavendish setting the pace with national time trial champion Alex Dowsett. As the race progressed, more and more of the Great Britain riders moved to the front of the peloton; the eleven leaders were gradually allowed to increase their lead however and, as they topped the Rugweg climb after 77.5km, it was up to 5’40”. The leaders climbed the Cauberg for the first time, and crossed the finish line to start the first of the ten laps; as Belgium’s Dries Devenyns led the bunch across the line, it was 5’11” behind. The Belgian continued to lead the peloton with Cavendish throughout the first lap and, across the line with nine to go, they had reduced the gap to 4’27”. Isaichev punctured in the break up ahead but, despite a slow wheel change from neutral service, the Russian eventually rejoined with the leaders. As the peloton hit the Cauberg for the third time, Spain’s Juan Antonio Flecha attacked; he was immediately joined by Great Britain’s Steve Cummings, France’s Maxime Bouet, Belgium’s Gianni Meersman and Japan’s Fumiyuki Beppu. Switzerland’s Michael Schär, Australia’s Michael Matthews and Italy’s Rinaldo Nocentini jumped across to the new group on the false flat that followed the climb. Across the line to start lap three the counterattacking group was 3’28” behind the leaders, with Belgium’s Johan Vansummeren leading the peloton over 11 seconds behind it. The Belgian team then took control of the peloton, but allowed the new group - which included Meersman - to get ahead. At the top of the Bemelerberg on the opposite side of the circuit the ten chasers had cut the gap to the eleven leaders to 2’33”, with the peloton still 3’31” back. At the end of the lap the gap between the two groups was just 1’49”, but Belgium led the peloton across the line at 2’17”. Having finished his work on the front of the peloton, Cavendish had dropped off the back and rode alone up the Cauberg to the finish to rapturous applause as his reign as World champion came to an end. The next time up the climb saw Spain’s Vuelta a España winner Alberto Contador accelerate at the head of the peloton. The lead group was 1’10” ahead of the chasers as it crossed the line with six laps to go, but the activity in the bunch behind had closed to within 1’42”. Belgium and the Netherlands increased the pace on the Cauberg, but Contador attacked again and pulled a group clear. With the Vuelta champion were the Netherlands Koen de Kort and Robert Gesink, Great Britain’s Jonathan Tiernan-Locke, Voeckler and Bouet, Italians Marco Marcato and Diego Ulissi, Bouet Voeckler, Switzerland’s Michael Albasini, and Belgium’s Björn Leukemans. The attackers quickly caught up with the chase group as it joined up with the leaders, and the new 29-man group was 29 seconds clear of the peloton as it crossed the line with five laps to go. This gap was up to 1’08” over the top of the Bemelerberg, while Cataldo increased the pace on the Cauberg the next time, which got rid of Mezgec, Beppu, Buts, Ferrari and Duggan. Rigoberto Uran of Colombia attacked the peloton behind them; across the line, the lone Colombian was 28 seconds behind the group, with Australia now at the head of the peloton, 48 seconds back. Lastras drove the group onto the foot of the Cauberg the next time, with Bouet taking over as the Spanish rider sat up. Flecha then took over from the Frenchman, as the Spanish in the group fought to hold off the peloton for as long as possible. A crash halfway back in the peloton brought down or delayed several riders as the entire road was blocked. Dutch favourites Niki Terpstra, Bauke Mollema and Lars Boom were among those caught behind the incident, along with Canadian Giro d’Italia winner Ryder Hesjedal, Americans Chris Horner and Tejay van Garderen, and Australian Richie Porte. The breakaway was down to 17 across the line with three to go, as Bouet, Lastras, Matthews, Isaichev, Smukulis, Schär and Cataldo were all left behind. The remainder was 48 seconds ahead of the front part of the peloton, which was less than 60 riders after the crash. Flecha and Coppel were doing the lion’s share of the work at the head of the group, but the Germans were slowly closing; Sweden’s Gustav Larsson tried to jump across the gap as it came down, but he was quickly pulled back, and as they approached the Cauberg the gap was down to less than 20 seconds. Coppel was dropped as the climb began, and Fuglsang, Anacona and Howes soon followed. Contador attacked again, with Leukemans, Voeckler, Meersman, Tiernan-Locke and the others in his wake, but the peloton was accelerating behind them, and the race was all back together shortly before the finish line. The peloton was just 70-strong as it began the penultimate lap. Spain’s Samuel Sánchez tried to attack on the long, steady descent, but he was followed by Australia’s Simon Gerrans at the head of the peloton. Talansky attacked on the Bemelerberg though, and he managed to get away; he was joined by Stannard and the two of them began to pull away. Meersman was leading the peloton behind the duo, but Great Britain’s Luke Rowe was right behind him and preventing anybody helping the Belgian’s lone chase. Talansky and Stannard managed to forced the gap open to 15 seconds, but it was down to less than 10 as they arrived at the foot of the Cauberg for the penultimate time. Stannard was leading, and managed to leave Talansky behind halfway up the climb, Kolobnev was accelerating at the head of the peloton however, with Nibali, Gilbert and Valverde lined up behind him and they caught the British champion before he reached the top. Nibali kept the pressure on towards the line, but the peloton was lined up behind him; Spain’s Dani Moreno then attacked into the finish, and was followed by Belgium’s Greg Van Avermaet, Austria’s Stefan Denifl and Voeckler. The three of them were three seconds clear of the rest at the bell, but were back in the fold shortly afterwards. Australia’s Simon Clarke led the peloton towards the Bemelerberg, but he had five Belgians in his wheel with Philippe Gilbert sitting pretty at the back. Sánchez cam through as the climb began, and the rest of the Spanish began to surge forwards. Contador then took over the pace, as the Australians began to surge forwards. Clarke then took over, with the Belgians on his wheel again; Leukemans led then the peloton over the top with 5.5km to go, but his trade teammate Marcato took over. Paolini lead around the final corner with Nibali in his wheel, but Roelandts, Boonen, and Kazakhstan’s Assan Bazayev were lined up behind the two Italians. Nibali then began to accelerate, but Leukemans had just brought Gilbert up to him, and the Belgian put in a devastating jump that nobody was able to follow. Boasson Hagen, Kolbnev, Valverde were giving chase, but Gilbert was clear over the top; Kolobnev was leaving the other two but the Belgian was holding his advantage. The three of them began looking at one another as Gilbert entered the final kilometre, and the peloton was bearing down on them. Gilbert began punching the air as he entered the final 200 metres, then sat up with 50 metres to go and celebrated all the way to the line.